After multiple mainstream media op-eds questioned why Alex Jones’ InfoWars was still allowed on social media, Facebook, YouTube, Apple, and Spotify responded by slamming the ban hammer down on InfoWars this week, and as a result, they are responsible for feeding and giving credibility to the same vitriol that they claimed they wanted to silence. Anyone who has spent time listening to Jones or watching his videos knows that he consistently caters to a fear-mongering “they are coming after us” type rhetoric that targets his current enemy. While that enemy used to be the federal government and the establishment in the United States, it has more recently become anyone he deems as “anti-Trump” in order to fit his apparent undying support for the current president. Those fears and rants were finally affirmed on Monday when several InfoWars pages were wiped from some of the largest social media platforms on the internet. Instead of silencing Jones, the collective ban ignited a fire under him, and within 48 hours, he claimed that his website has attracted 5.6 million new subscribers. Jones told the Daily Mail that he blames the Democratic Party—the ultimate epicenter of the “anti-Trump” enemies—for the ban and that 5.6 million people subscribed to the InfoWars newsletter and podcast in the 48 hours after the ban was announced. The latest comments from Jones may sound like they are part of one of his many anger-filled rants, but for the people who follow him, they are a reminder that the censorship he has been warning about for years, is finally here. While the claim that InfoWars has amassed 5.6 million new followers in 48 hours is likely exaggerated, there is evidence that the ban caused people to flock to the website and to look for new ways to listen to his show. 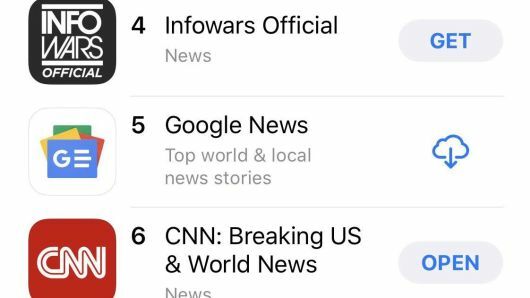 The “InfoWars Official” app skyrocketed in popularity on Monday, and within 24 hours of the announcement that the outlet had been banned by Facebook, YouTube, Spotify and Apple Podcasts, the app was listed as #4 in the News category of the Apple App store—which put it ahead of Fox News and CNN—according to a report from CNBC. The same fervor to take a stand against hate speech was claimed by Facebook and YouTube—but the social media giants failed to admit that by banning Jones and InfoWars, they were actually doing their part to give credibility to all of his hateful ideas, thus stoking the divide even further. By attempting to silence one side of an argument, the establishment simply created a larger riff in society and ruined any chances of certain ideas being peacefully discussed and discredited in the public sphere. The silencing of Alex Jones effectively erased part of the gray area in which people had the potential for compromise by labeling some ideas as good and others as bad. Now, just as the establishment wanted, the discussion is black and white again and people are at each other’s throats. This transformation caused a riff within the libertarian community as a whole and even inside InfoWars with many employees jumping ship while others were fired and gagged. His political enemies are likely salivating over the recent bans. However, even if you hate Alex Jones with every inch of your body, silencing him is a win for tyranny and censorship. While Jones referred to himself as a “sacrificial lamb,” he is not wrong about the fact that he is being used to set the example, and the ban hammer that was used against his outlet can easily be applied to alternative media outlets and independent journalists who rely on website traffic for their revenue—and because they do not have the same cult following as InfoWars, they will likely cease to exist. The censorship and the “war on information” Alex Jones has been raging about has finally come true for his outlet and he has been vindicated in the eyes of many of his supporters. 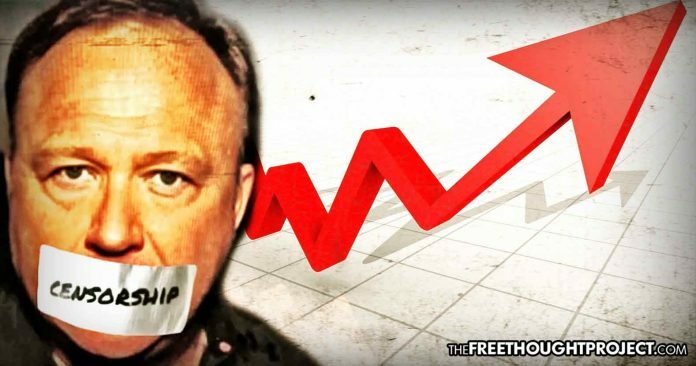 But rather than losing support because his followers are fed up with his fear-mongering rants, hateful rhetoric, and newfound support for the left/right paradigm, Jones is now more popular than ever because Facebook (which has been caught misusing the data of millions of users) and YouTube (which has been caught hosting hundreds of videos that cater to pedophiles) were the platforms that finally gave Jones what he wanted.